Ahrong Kim is a New York based artist born in Korea. 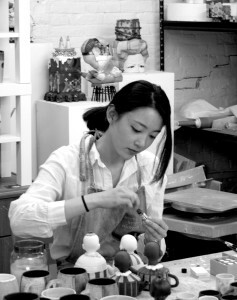 She received her BFA in Ceramics from Kon Kuk University in Korea in 2008 and her MFA from Rhode Island School of Design (RISD) in 2013. She has exhibited and participated in artist residencies internationally. Recent solo exhibitions ‘Internal Voice’ at The Clay Studio, Philadelphia, PA and ‘Ahrong Kim, New Work’ at the George Billis Gallery in Manhattan, NY. Selected group exhibitions of her work included Visual Voices: Truth Narratives at NCECA 52th Annual Conference in Pittsburgh, PA and Workhouse Clay International in Lorton, VA where her work ‘Dazzling Lonesomeness’ was chosen for the Best of Show Award. Ahrong Kim is highly sought after by art collectors around the world.